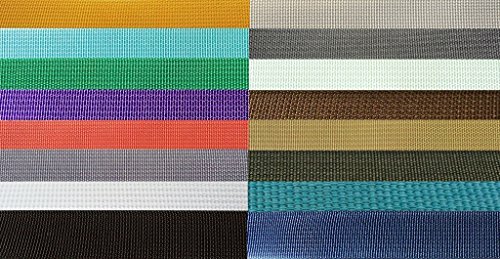 Backpack Nylon Webbing: This hard-to-find medium-weight webbing is very versatile and can be used for any number of applications. It is used primarily in the Backpack industry for backpacks, hand bags and luggage. However, is also used for MARTINGALE DOG COLLAR, tie-downs, compression straps, Lawn chair weaving, etc. It is a 100% Nylon webbing and very durable. Our 100% Nylon webbing has the greatest strength for rugged applications with a 3000 pound breaking strength. This is the webbing you find on high end backpacks, totes and luggage. This is a medium weight webbing .035" or 1mm thick. If you order more than one lot it will come in one piece.